Back onboard and down to four it was time to leave Port Forum and begin our cruise north to the French Border and return with Barry and Kim. With just on two weeks to cover the round trip of around 200nm (370km/ 230m) this was definitely going to be the least distance covered for us in this amount of time - welcome to real cruising. 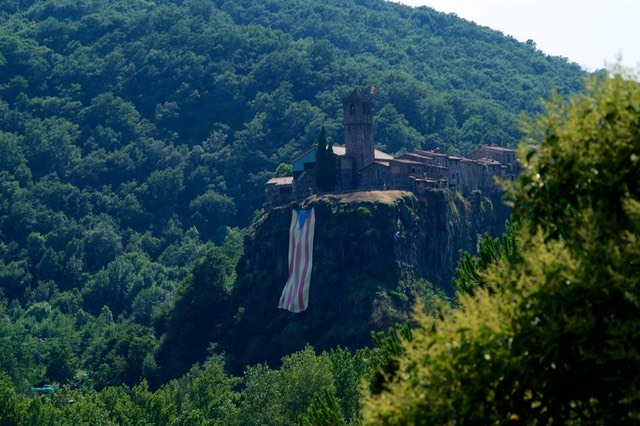 The first thing we have discovered since arriving in Catalonia - the region that hugs the northeastern corner of Spain to the French border is that the people here are fiercely proud of being Catalonian. So much so that last year in the regional capital of Barcelona on the 1st of October following a referendum the region declared independence from Spain. The unauthorised referendum threw the region into political conflict with the National Authorities based in Madrid and is said to have been one of the worst political tensions to occur in many years. Currently six Catalonian Politicians are living in political exile after fleeing Spain when the separatist movement collapsed to avoid prosecution for rebellion. Nine others are currently in the Spanish jails awaiting possible trial for being involved in the promotion of the region to succeed. 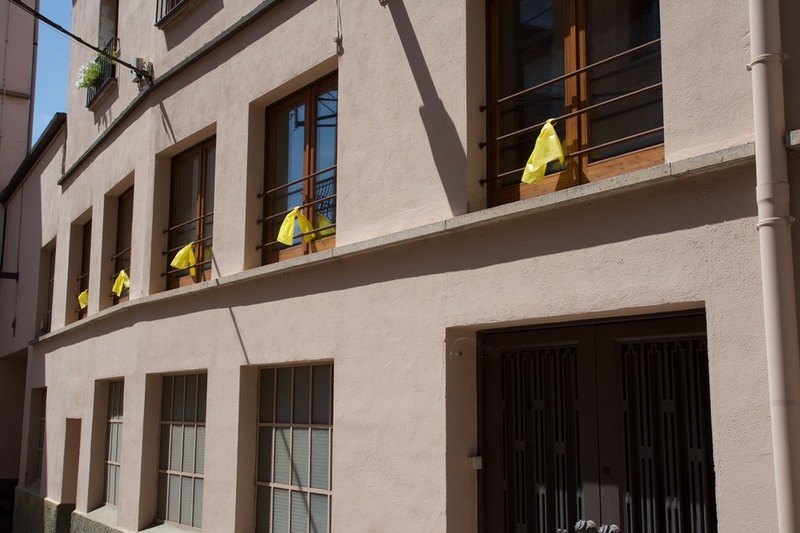 Throughout Catalonia not only do Catalonian flags hang from windowsills but yellow ribbons appear literally everywhere. On Statues, balcony balustrades, roadside posts, people and plastered on the road pavements. 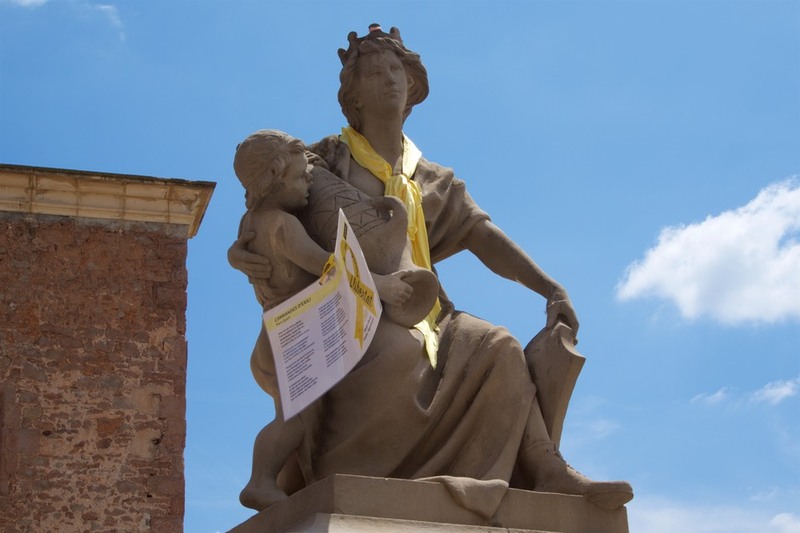 The significance of the yellow ribbon is apparently to have compassion for those who have been imprisioned and to protest for their release. As in all things political the fight for independence from Spain is said to have caused much division between families and on the international scene was not even recognised. 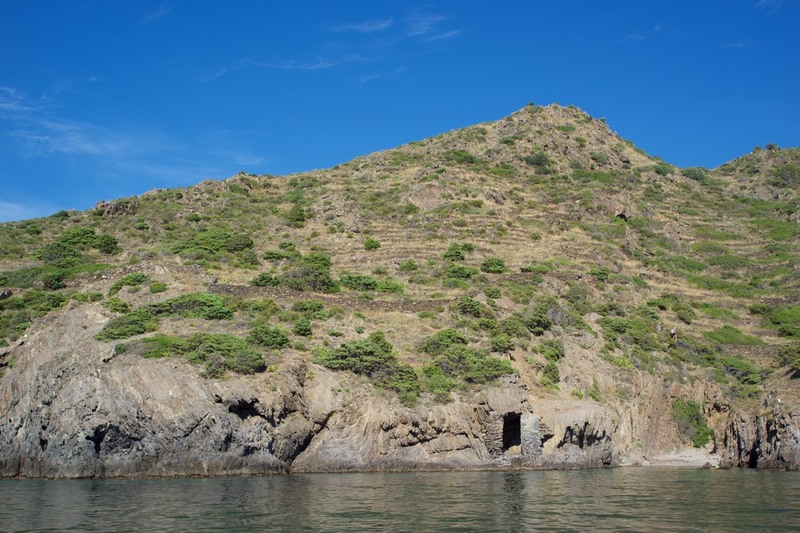 Politics aside we have to say the region hosts amazing food, completely changed our appreciation for the quality of cava, saw more fortifications along the coast then you could count, beautiful mountain scenery when we land toured, great bays for anchoring with superb understated beach side restaurants, no charter sailing boats of noticeable numbers and friendly helpful people. 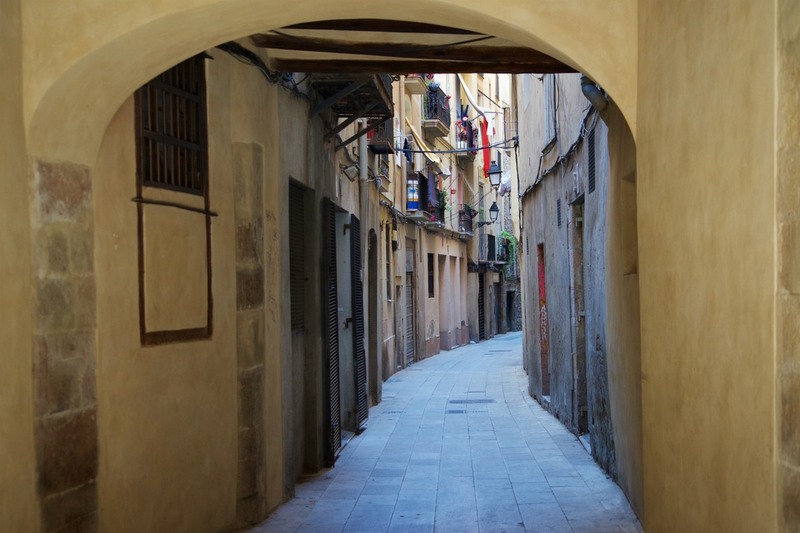 We have simply loved cruising and land touring Catalonia. 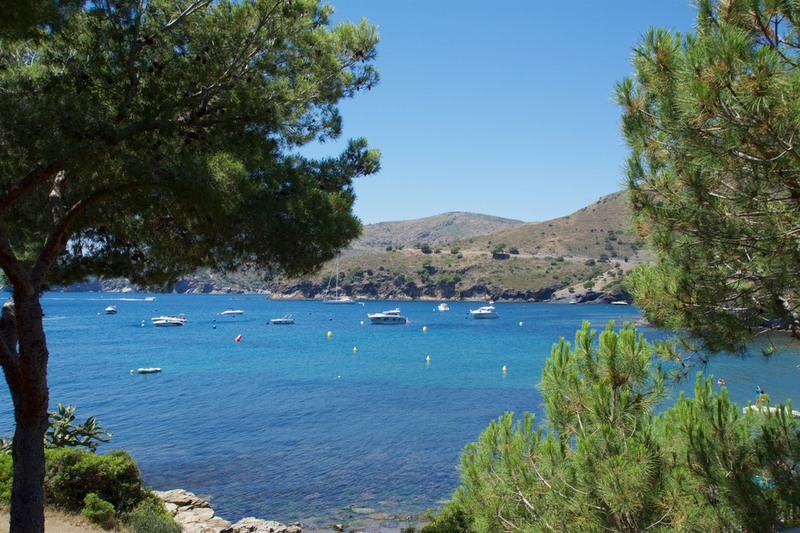 The plan of attack was to sail north to the French harbour of Port Vendres quickly, then cruise leisurely back to Barcelona. The fishing harbour of Port Vendres was to be our most northern base and its colourful buildings instantly stood out from the white washed buildings we had been passing in Spain. 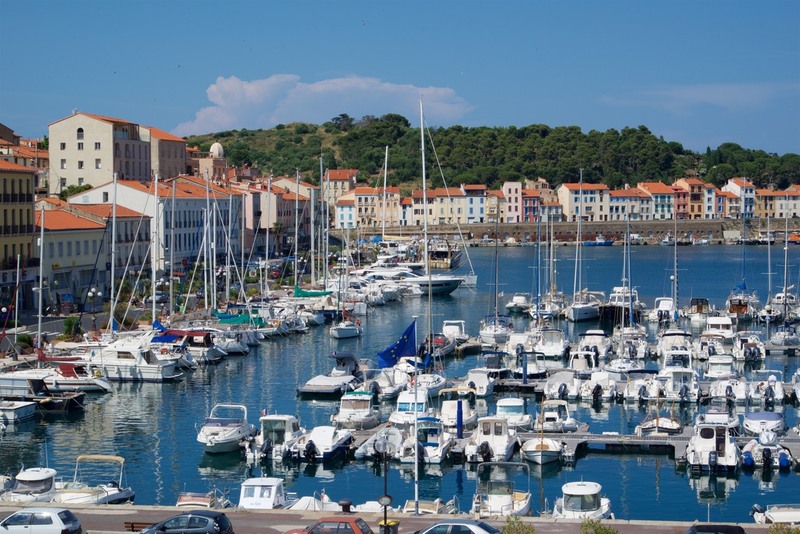 The pretty town still operates as a fishing port and is somewhat overshadowed by the neighbouring town of Couilliere a few miles north that we had visited last year by road. The amenities were perfect. Right at our back door was a Patisserie and just a short walk up the road a local butcher and fruit and vegetable shop. Throw in restaurants serving the freshest seafood and we were very happy with our choice of harbour. 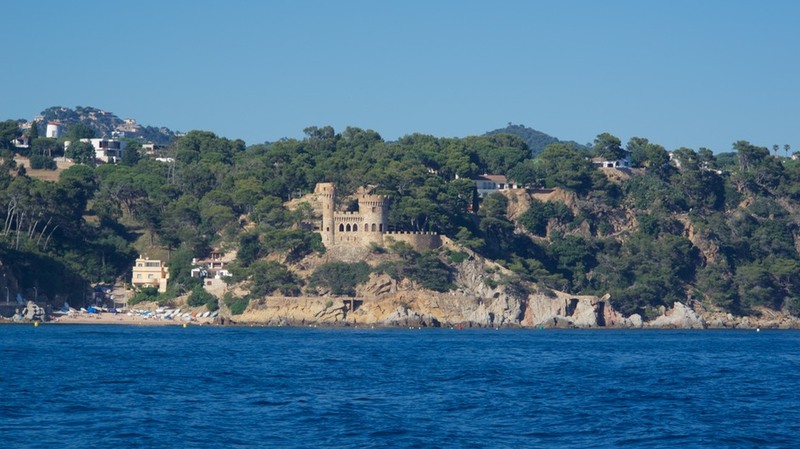 Cruising back to Barcelona we discovered many beautiful bays but three really stood out. Cala Captiva, Cala Montgo and Cala Pelosa. 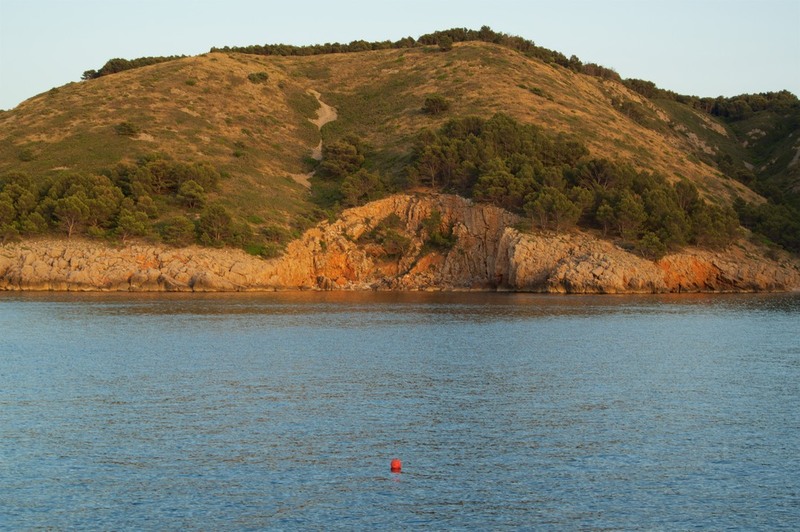 The latter two were both in the Golfo de Roses and both provided good shelter from opposite directions of winds which was most beneficial given they were only 8 miles apart. 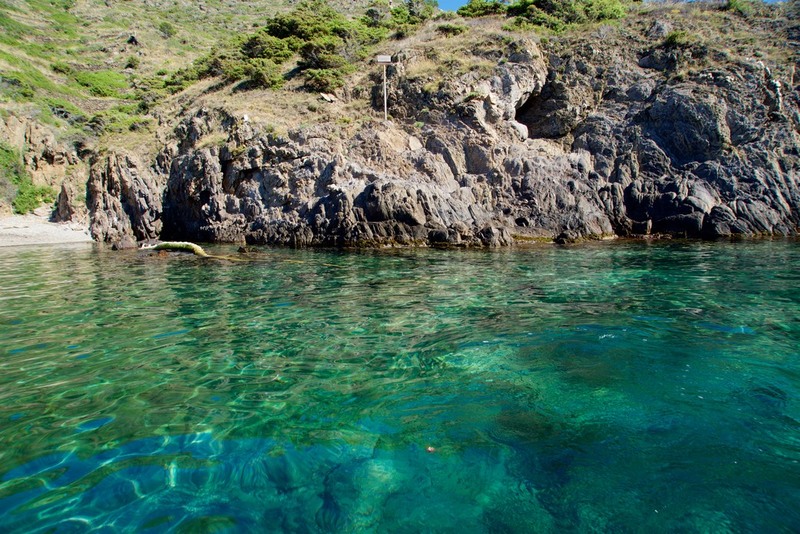 Cala Captiva was a small rocky cove that had interesting terracing and stone structures scattered up the hillside. The water was amazingly clear and in the evening we found ourselves as on most nights in other bays alone to enjoy the tranquility. The highlight of the bay was definitely the limited number of boats and the absence of jet skis. Holding was not the best so it was definitely a fair weather anchorage only. 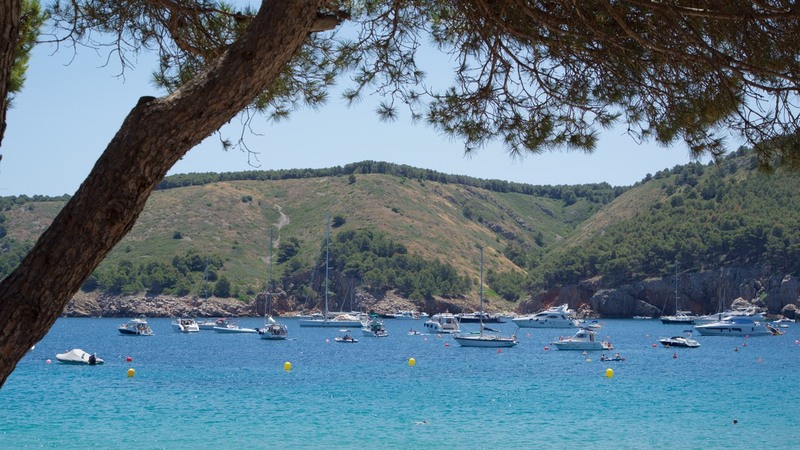 A slightly busier harbour than Cala Cativa was Cala Pelosa. 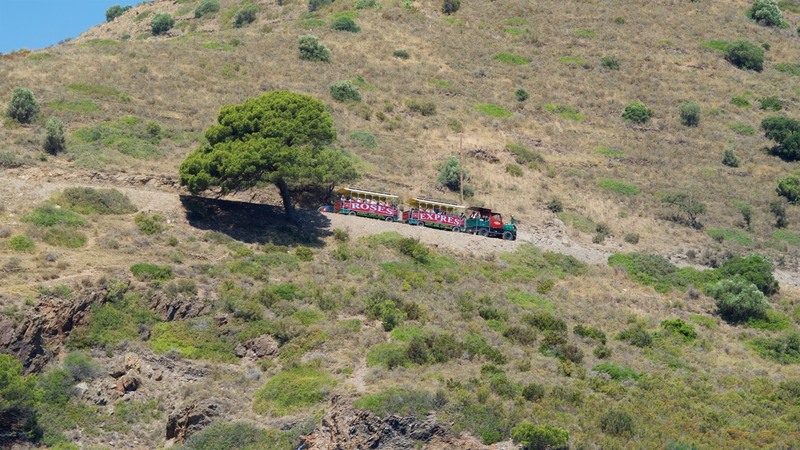 During the day predominantly power boats would arrive followed by jet skis and finally the tourist train would haul people over the hillside from the neighbouring town of Roses to enjoy the small beach and beachside restaurant that served seriously good food. Despite the number of boats we were tucked out the back of the bay on Katherine and found the anchorage to be relatively peaceful. Though paddle boarding was definitely best done in the morning before the boat traffic set in a challenging swell. At night again we would often find ourselves on anchor with just one or two other boats. Getting to the restaurant was simply a matter of calling up the taxi service so no need even to haul out the dinghy. 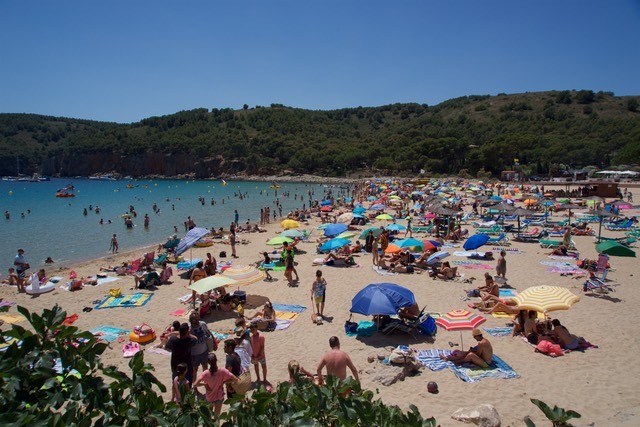 The Beach at Cala Montgo - seemed to be the place to be! 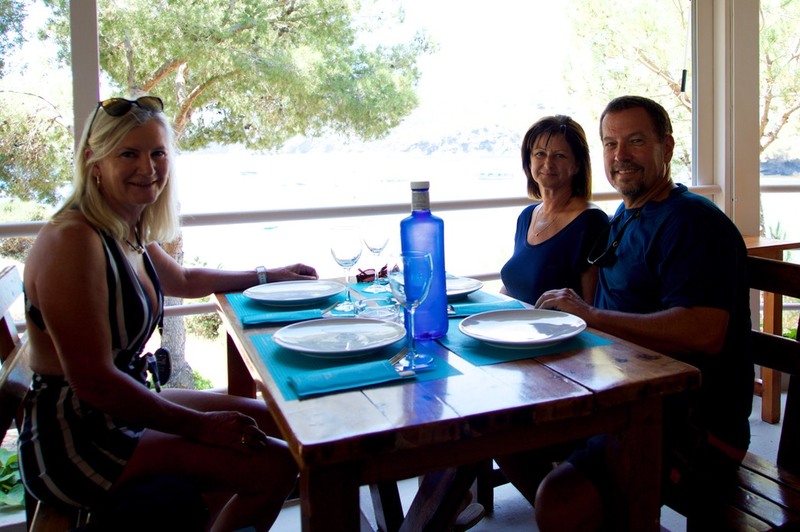 Cala Montgo was one of the busiest anchorages we stayed at but came with the added advantage of services such as a supermarket, a relatively large selection of restaurants from which to choose and even a local fisherman selling fresh oysters. 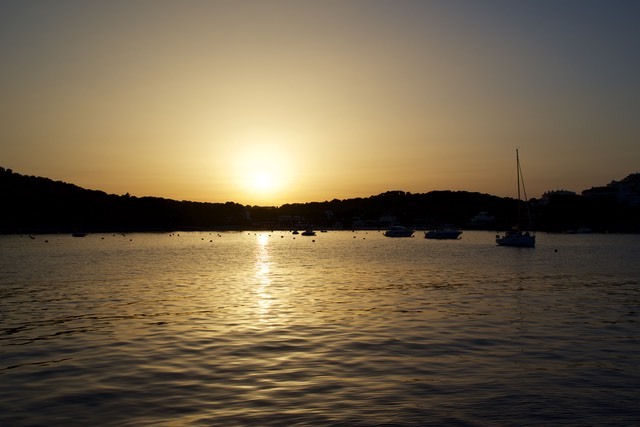 The bay was wide enough that we were able to put down chain in around 15 meters away from the majority of the fleet that were anchoring around the perimeter of the bay or were attached to moorings. Sadly Wilson our anchor ball came to grief in the bay. One of the many motor boats that did not appear to notice him ran him down never to be seen again! Wilson the Second almost came to the same tragic end the following day. Think we may need to attached a very large flag to Wilson the 2nd for his protection. Again on sunset we would find ourselves in relative solitude. 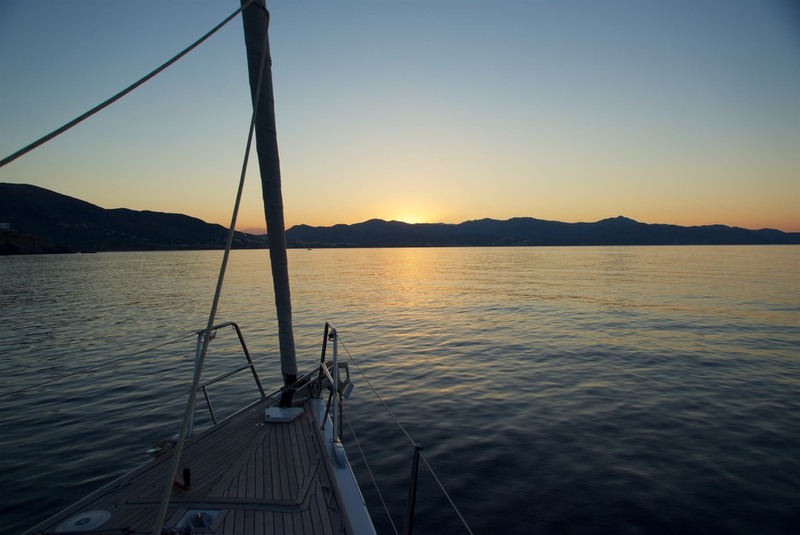 It has been the nicest contrast to our experience of anchoring in the more popular areas such as the Balearics, Sardinia or Corsica. 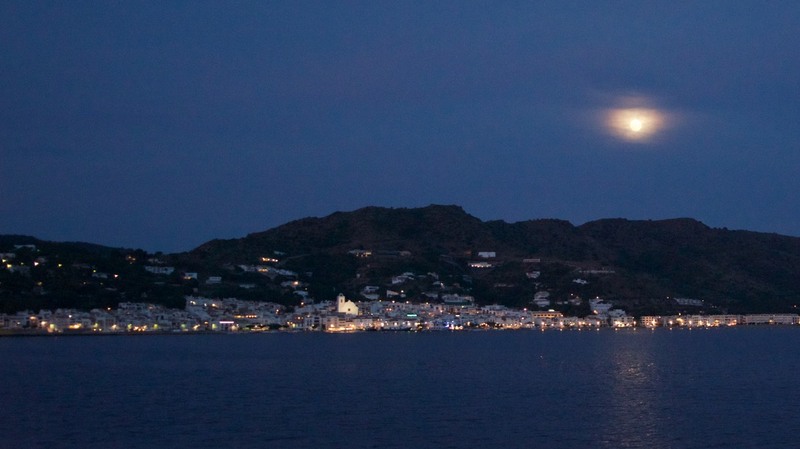 Though the wind continues to be ever changeable and the sea state not always a reflection of wind strength this area has changed our view of cruising in the Mediterranean to a far more positive one. Back in Barcelona we took up residence at Badalona Marina as Port Forum was full. A mile further north from Port Forum it is still very easy to access Barcelona by train or tram. Next to the marina is a beach that stretches north for 3 kms with low key cafes and restaurants dotted along the foreshore. 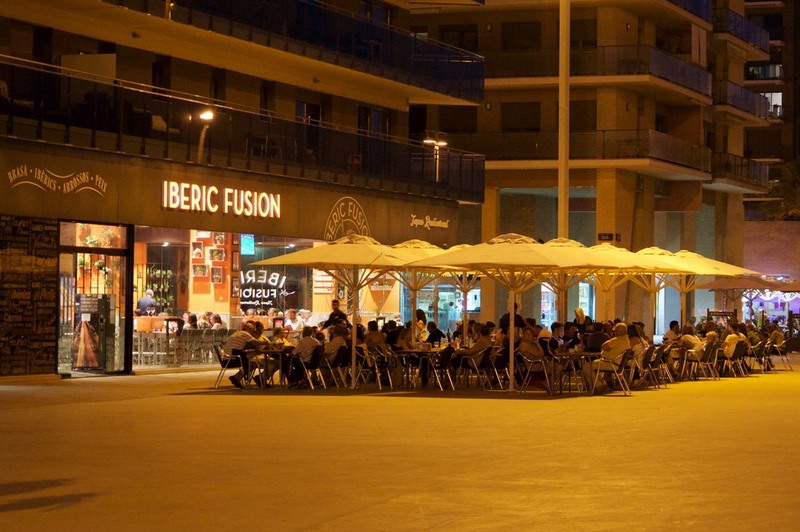 Every night it is alive with people of all ages to late in the evening enjoying summer. Or should I say early in the morning as most do not come out till ten pm at night. So for Barry and Kims last day in Barcelona we headed back into the city centre and enjoyed a “walking day” around the sights of the Old Town. 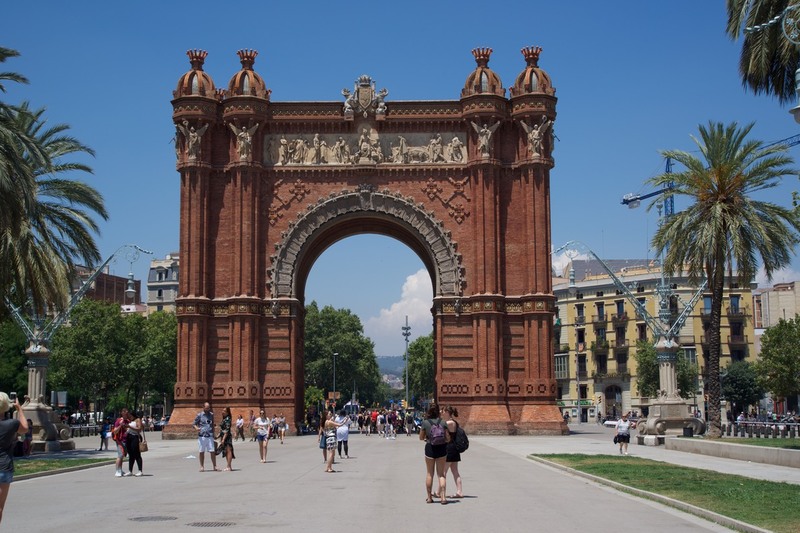 Starting at the Parc de la Ciutadella we wove our way through the streets discovering the Arc del Triomf that was the main gateway to a Universal Exhibition held first in Barcelona in 1888 and a second time in 1925. 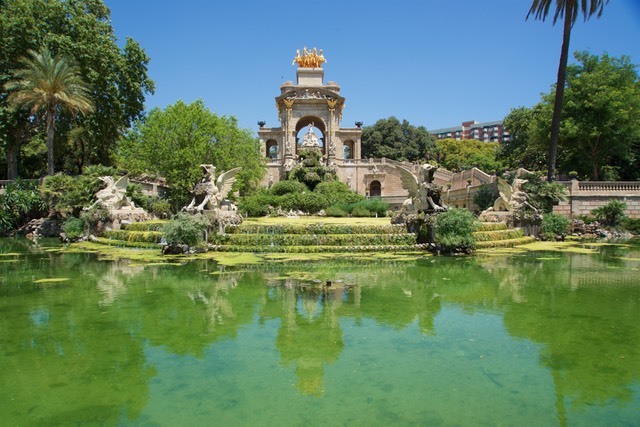 The Exhibition promoted art and industry and brought international recognition to Barcelona. We walked for hours around the old town and discovered yet another great restaurant with local cuisine. It certainly had been a relaxing few weeks with Barry and Kim onboard. More books were read, paddle boarding, boat cleaning, and good food and wine discovered in a relative small area of cruising. Can only say again loving “cruising” in Catalonia.